Karla A. Lira is a Ph.D. History student at the University of Houston. Lira’s research focuses on multi-racial dynamics of Latinos and Blacks in the space of Basketball during the 1960s. Her current project, “True We’ll Ever Be,” sheds light on the social relations Latinos and Blacks had in the city of Houston and the University of Houston Basketball Program through oral interviews. She was kind enough to share some of her research with us below. HOUSTON, March 2019 — After the Spirit of Houston band finished the last stanza, first comes Galen Robinson Jr., then Armoni Brooks, followed by Corey Davis Jr., and the rest of the Men’s Basketball team to “The Cage,” the specially designated courtside student seating section, to high five all the student fans in a new cougar tradition. Black, Latino, Asian, all races celebrate together at the Fertitta Center as the University of Houston, one of the most diverse universities in the nation, celebrates another victory. This freedom of celebration, race inclusion, and community was not always the case. In 1962, the university integrated and signed the first African-Americans, Elvin Hayes and Don Chaney to play basketball. The social transition was eased by various people including Coach Guy V. Lewis, Harvey Pate, and student manager Howard Lorch. These individuals challenged the societal prejudice against the Black community. As Elvin “BIG E” Hayes recalled, student athletes such as Don Chaney, Warren McVea, and others helped create this integrated environment which everyone can enjoy. Because of Houston’s unique history of desegregation and racial dynamics, I am researching Latinos in the basketball sphere. 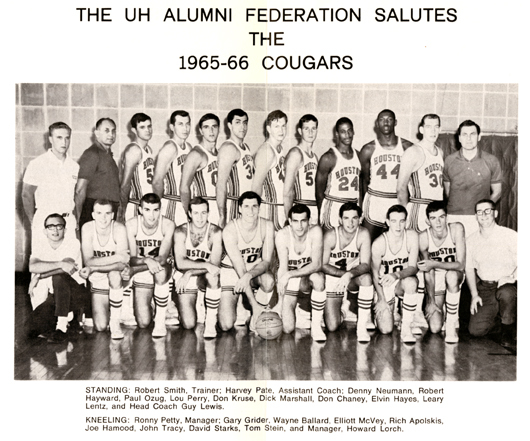 I am building my research on Katherine Lopez’s Cougars of Any Color: The Integration of University of Houston Athletics, 1964-1968, which emphasizes the many facets of racial integration at the university’s athletics program in the 1960s. I am also using The University of Houston Athletics Department Records in Special Collections where I have found pamphlets, donor records, and program guides that have uncovered race relations during the Civil Rights Era at University of Houston. My research breaks the Black and white racial dynamics by adding Latinos into the conversation. The hardships of Hayes, Chaney, and McVea’s experience have set the pathway for diverse athletes to be here. This 2019 season is special. The UH Men’s Basketball Team won the regular season American Athletic conference championship, were the first to make it to the NCAA Sweet 16 since the Phi Slama Jama reign, were the first in the history of the institution to host ESPN’s College Game Day, and were one of the seven teams chosen by the NCAA to be part of their March Madness Confidential Series. The Cougars broke several records; Corey Davis Jr. has scored more than 1,000 points, making him the 48th player to accomplish this at the institution. The eccentric senior, Galen Robinson Jr. has triumphed in over 100 victories during his time in the Cougar uniform and is still counting. With March Madness reaching its crescendo, it is important to give credit and acknowledge those that broke the racial barrier and made it possible for student athletes, coaches, staff, and students to come together and enjoy this communal winning moment. Go Coogs! Special thanks to Elvin Hayes and Howard Lorch. Your kindness is felt.